National Park Service (NPS) Certified Historic Districts are those state or local historic districts that have been certified by the Secretary of the Interior (Secretary) for purposes of the Tax Reform Act of 1986, as substantially meeting all the requirements for listing in the National Register of Historic Places. As a result of this determination, individual property owners of depreciable buildings within the certified district may pursue Federal tax incentives of historic preservation by completing the Historic Preservation Certification Application and submitting them to the California Historic Preservation Office (CA SHPO). Applications should be submitted as early as possible in the planning of a rehabilitation project. Review boards and commissions should become familiar with the Secretary of the Interior’s Standards for Rehabilitation used by the Secretary in certifying rehabilitation work for the historic preservation tax incentives. It should be noted that contrary to most local historic review criteria, the interiors of a building may be subject to CA SHPO and the NPS review when an owner submits a project under the Federal Historic Preservation Tax Incentives program. The CA SHPO and NPS are available to advise individuals and organizations about the Standards. Certification is for purposes of the Federal Preservation Tax Incentives Program only, and not the National Register of Historic Places. It constitutes a determination of eligibility for listing in the National Register of Historic Places, because it was evaluated under the National Register criteria and found to meet them. The certification is not a National Register listing, however, and the certified local district is not a formal National Register historic district as a result of this process. If a listing in the National Register of Historic Places is needed in the future for purposes beyond the scope of the Federal Preservation Tax Incentives Program, you may contact the CA SHPO Registration Staff to pursue listing procedures outlined in Federal Regulations 36 CFR 60. 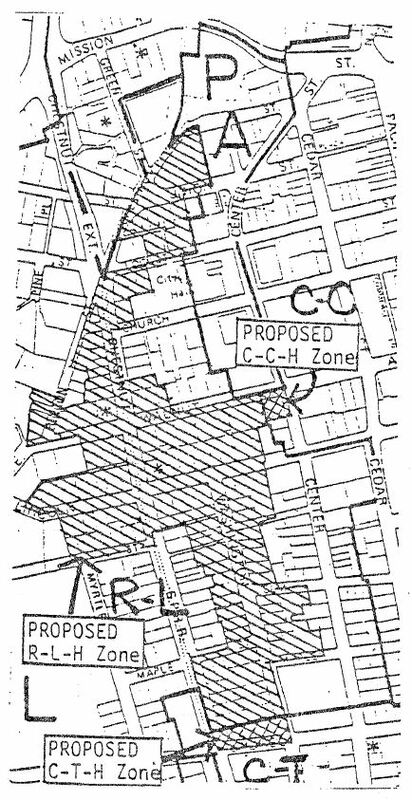 Changes to the historic district as certified may render the certification null and void and require recertification of the revised district for continued benefits under the above laws. The state or local historic district must be justified and documented to the extent that it can be certified by the Secretary of the Interior as substantially meeting National Register criteria. For the purposes of this regulation (36 CFR §67.8), a state or local statute is a law of the state or local government designating, or providing a method for designation of, a historic district or districts. This includes any by-laws or ordinances that contain information necessary for the certification of the statute. A statute must contain criteria which will substantially achieve the purpose of preserving and rehabilitating properties of historic significance to the district. The statute generally must provide for a duly designated review board or commission, with power to review proposed alterations to structures of historic significance within the boundaries of the district. In general, any State statute must be coordinated with local governments and be accompanied by local statutes implementing the State law. For specific information on State statutes see 36 CFR §67.8. • A description of the general physical or historical qualities which make the area a district, and an explanation of the boundary. • A concise statement of significance and why the district meets National Register criteria for listing (see 36 CFR Part 60) with the relevant criteria identified (A, B, C, and/or D). • A definition of what types of properties contribute and do not contribute to the significance of the district as well as an estimate of the percentage of properties within the district that do not contribute to its significance. • A map showing all contributing and non-contributing properties as well as the district’s boundaries. • Photographs of typical areas in the district as well as all of the properties within the district; all photographs must be keyed to a map. • Requests for certification must be made by the Chief Elected Official or an authorized governmental representative of the government in which the district is located. • Send requests to the CA SHPO; attention the Registration Unit. • The CA SHPO has 30 days to comment on the request before forwarding the request to the NPS representative of the Secretary. • The NPS generally provides written notification within 30 days of receipt to the authorized representative and to the SHPO when certification is given or denied. • Districts certified by the NPS as substantially meeting the requirements for listing will be determined eligible for listing in the National Register at the time of certification and will be published as such in the Federal Register. Long Beach, Oakland, Pasadena, Pittsburgh, Redwood City, San Diego, San Francisco, Santa Cruz, Sausalito, and Stockton. A description and boundary map of each can be found below, with a downloadable list of their properties. These properties are eligible to receive the 20% federal Historic Preservation tax credit. Descriptions for Attribute Codes on the last column of the property list are available here. The entire document they are part of, "Instructions for Recording Historical Resources" can be found on the OHP web page "Historic Contexts & Surveys for Local Planning". Drake Park is an early 20th century residential neighborhood containing 188 structures (including outbuildings) of which about 81% contribute. The character is predominently single-family dwellings in colonial revival, craftsman and spanish revivals. Many are notable examples of the bungalow style. 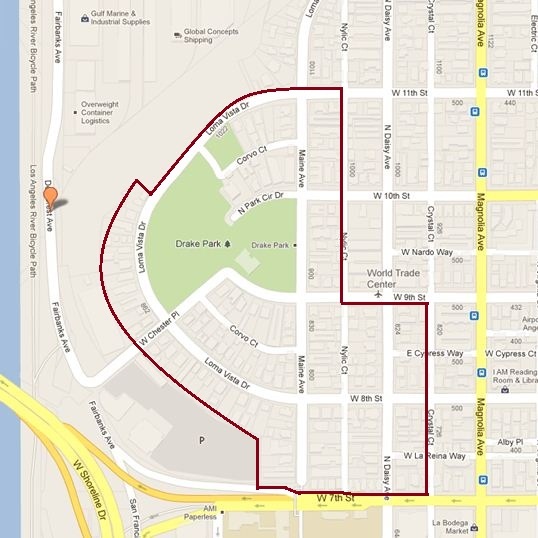 The properties are located within a series of concentric half circles centering on Drake Park, an early planning feature of Long Beach. A PDF of the properties located in the Historic District may be downloaded here. One tax credit project was completed in 2008 at 640 W. 8th Street in the Drake Park District. Information on this project is included in OHP's 2008 Certified Projects and Completed Reviews document found on our Certified California Tax Incentive Projects web page. The Victorian Row Historic District represents the most cohesive surviving section of Oakland's nineteenth century business district. It is significant for its role in the commercialdevelopment of the leading city in the East Bay, and as a cohesive district of late nineteenth century structures representative of finely detailed commercial design of the period. 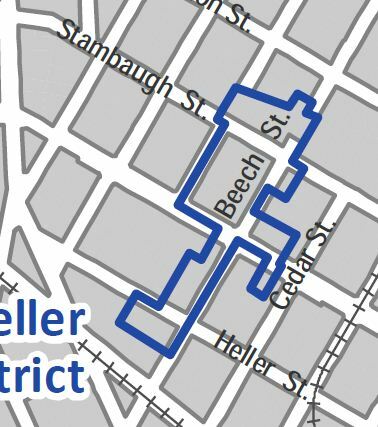 Although small, the district conveys a sense of time and place keyed to the period of greatest commercial expansion in nineteenth century Oakland. Old Pasadena Historic District structures are mostly from the 20th century, many dating back to the 1920s. 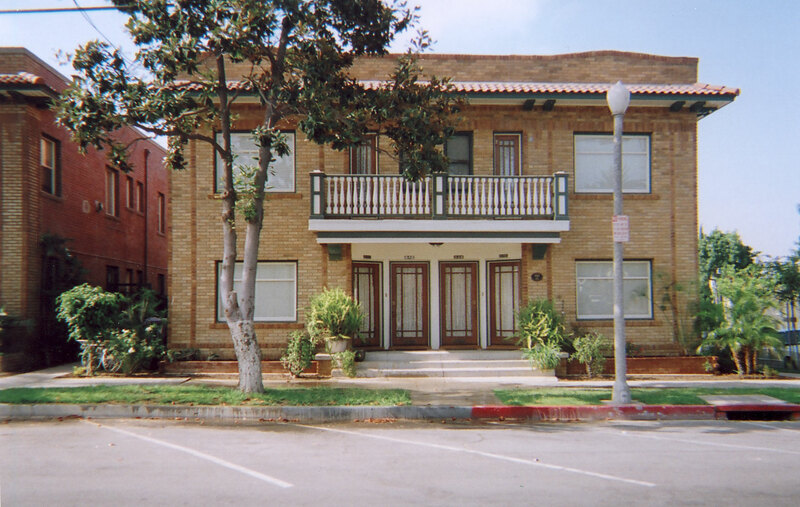 The architecture of the district is representative of commercial architecture in early 20th century southern California, with a concentration of Spanish Colonial, Spanish Baroque, Mission Revival, and Moderne/Art Deco buildings. The work of several prominent local architects are likewise represented: Greene & Greene, Frank D. Hudson, and Frederick Marsh to name a few. New York Landing was originally a 19th century port and supply center for nearby coal mines. Renamed Black Diamond, it became a major coal shipment center. In the early 20th century it became a center of steel production and was renamed again as Pittsburg. The district is a cohesive unit of one and two story commercial structures dating from approximately 1914 to 1930. The individual buildings reflect major American architectural trends of the time. A list of properties belonging in the historic district can be downloaded here. Stambaugh-Heller contains the largest concentration of Redwood City's pre-1900 homes. Nineteen structures contribute significantly to the district. Dates of construction range from around 1860 to 1915. The oldest church in Redwood City is within the district, built in 1874. The district exemplifies the the working class character of early Redwood City. Architectural styles represented include Eastlake, Queen Anne, Italianate, Farmhouse and Greek revival. A PDF of the properties located in the Stambaugh-Heller District may be downloaded here. The newly expanded historic district is an assemblage of some of Redwood City's most prominent and significant commercial historic structures. Fifteen structures contribute. There are fourteen commercial properties and one meeting hall. 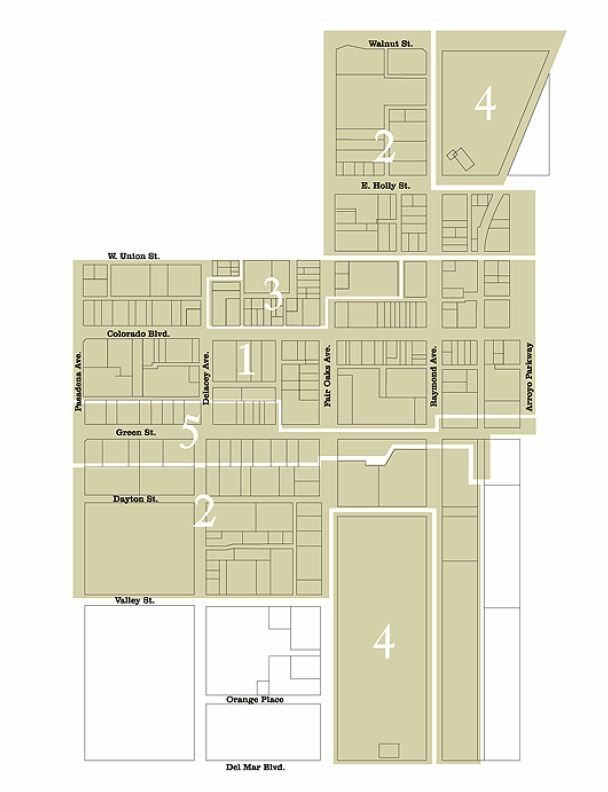 The district includes portions of seven blocks, the 700, 800, 900 and 110_0 blocks of Main Street, the 2000 block of Broadway, the 1200 block of Middlefield Road and the 100 block of Stambaugh Street. Four of the structures presently comprise a National Register Historic District and have been designated as individual local historic landmarks. The expansion includes the portions of the 900 and 1100 blocks of Main Street, the 1200 block of Middlefield Road and the 100 block of Stambaugh Street. The expansion includes one property that has been previously designated as an individual historic landmark, known historically as the Foresters Hall at 1204 Middlefield Road. Three additional properties are nominated for individual landmark designation as part of this expansion proposal; they are known historically as Flynn's Ford Agency & Garage at 935 Main Street, Dessin Bros. - Barnbauer Motors at 1101 Main Street, and the Clifton Motor Co., The Chevrolet Agency, at 847-849 Main Street. 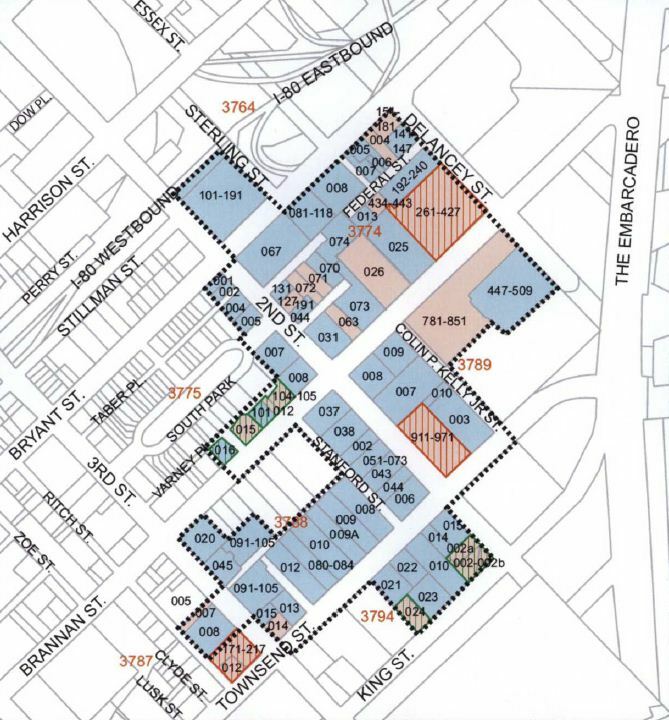 Many prominent pioneer and early-day residents and organizations are associated with the buildings in the proposed expanded district. 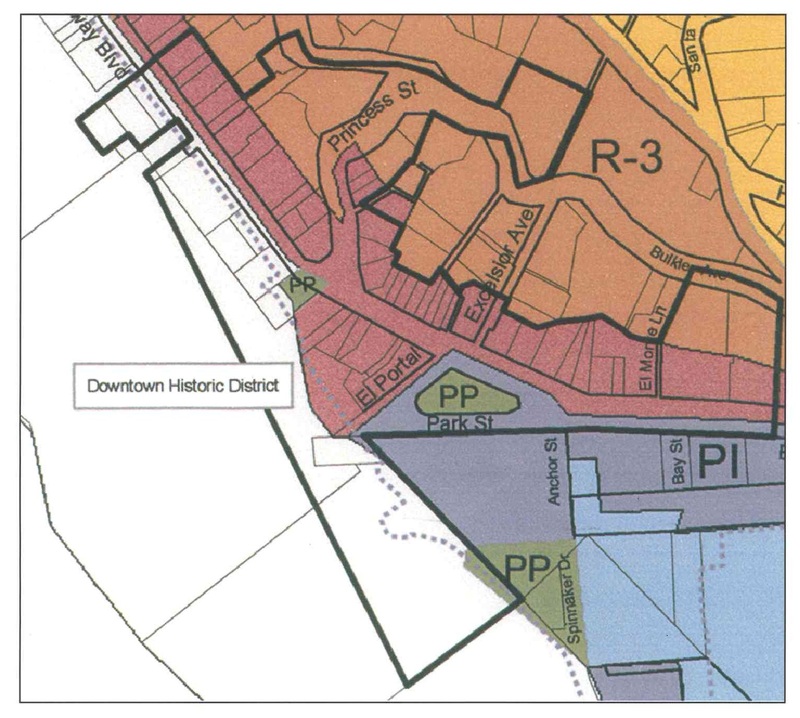 The boundaries of the proposed expanded district were chosen because this is a pioneer commercial area of contiguous, historically contributing commercial structures. 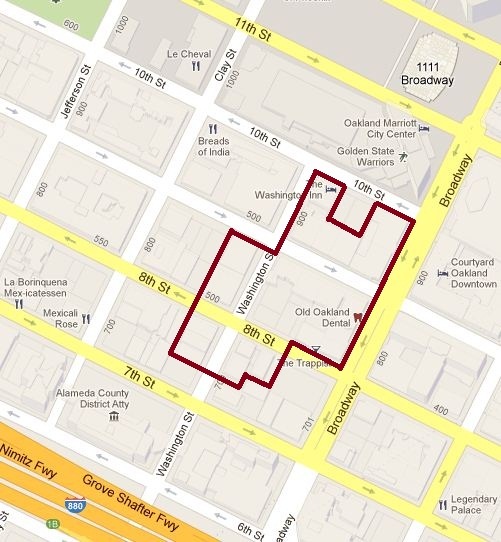 A PDF of the properties located in the expanded Main Street Historic District can be downloaded here. The architecture of the gaslamp Quarter is characterized by structures erected between 1880 and 1910. They are typically two to three stories tall and are constructed of common brick with continuous facades at the property line. Facades are designed with closely set bays framed with segmental, stilted or flat arches 10 to 12 feet apart. Openings and entrances are typically deep set. Heavy ornate cornices and spandrels, carefully detailed parapets and bay windows are also typical design elements. A PDF property list may be downloaded here. Unlike most other areas of the San Francisco waterfront, the South End District contains an extraordinary concentration of buildings from almost every period of San Francisco's maritime history. Several street fronts--such as Second, Third and Townsend-are characterized by solid walls of brick and reinforced concrete warehouses. With this harmony of scale and materials, the South End Historic District is clearly a visually recognizable place. Multi-story buildings have been more common along the southern waterfront since the turn of the century. 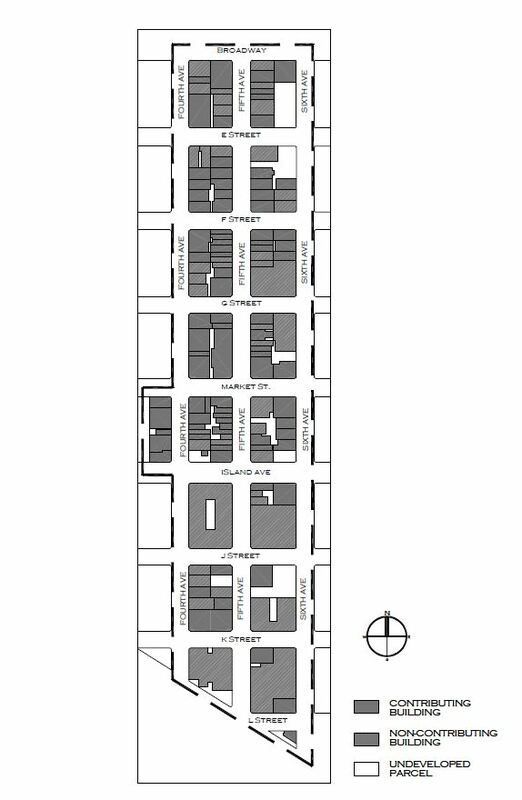 After 1906, almost all new warehouses were constructed to be at least three stories in height, and several warehouses on Second and Townsend Streets reached six stories. South End's period of historical significance, 1867 to 1935, comprises the era during which the waterfront became a vital part of the City's and nation's maritime commerce. The buildings of the South End Historic District represent a rich and varied cross-section of the prominent local architects and builders of the period. Four buildings remain from the nineteenth century; another four were constructed in the six-year interval preceding the 1906 earthquake. The majority of the buildings were erected between 1906 and 1929, a period during which trade along the waterfront increased dramatically. The proposed historic district is an important visual landmark for the City as a whole. The large number of intact masonry warehouses which remain to this day are reminders of the maritime and rail activities which helped to make San Francisco a great Turn-of-the-Century Port City. The warehouse district, because of its distinct building forms, is identifiable from many parts of San Francisco and the greater Bay Area. A list of South End District properties can be downloaded here. The main feature of the Mitchell Block is Plaza Park. Inn the early 1900's the Park was a natural setting for the community which surrounded it. The Park was used for many special occasions. Most popular were band concerts and annual May Pole dances. July fourth celebrations were held in the Park as well as political rallies and speeches. A significant feature of the District is the row of California Craftsman bungalow houses on East Thompson Boulevard. A list of the Mitchell Block properties can be downloaded here. The Downtown Historic District contains an exceptional concentration of older homes that typify the city's social and architectural diversity over the period of its early growth, from the 1860s through the turn of the century. All major architectural styles that were adopted locally during those years can be found in this area. Examples range from architect-designed mansions of community leaders to the simple cottages of working people. 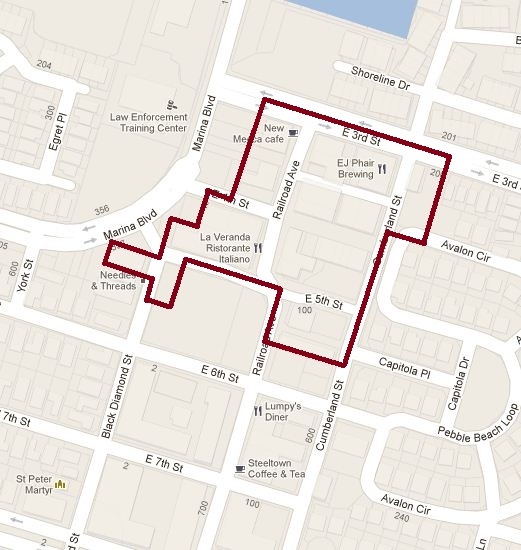 A property list of the Santa Cruz Downtown Historic District may be downloaded here. 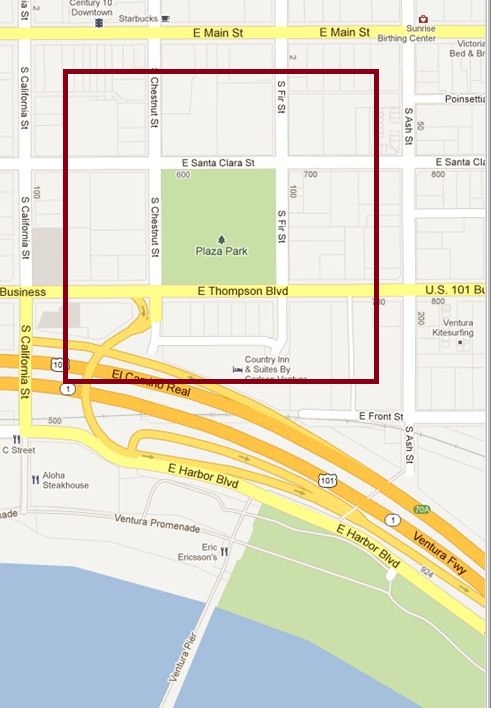 The historic district boundaries were determined to be that of the present and historical central business district. Within the central area, a variety of architectural styles are evidence of the city's growth and change since 1868. District styles emerged between 1885 and 1900 and again between 1914 amd 1924. Both periods represent times of growth and heavy construction in the downtown area. The commercial architecture in the historic district exemplifies some of the most notable examples of these time periods. The first period was typified by an Italianate commercial, a variation of Northern California storefront Victorian, These structures sported false fronts, friezes, bracketed or boxed cornices, flat windows with hoods or pediments, or bay windows decorated with medallions or flat columns. The second period was characterized by by a more utilitarian approach to commercial architecture - sturdy brick or concrete construction, erecessed entryways, plate glass windows, transoms, and a reserved exterior decoration except for occasional false-front silhouette, mission style revival or grand classic revival facade. A list of properties in the historic district can be downloaded here. An original Map of the District can be downloaded here. The Magnolia Historic District contains the richest variety and blend of architectural styles found anywhere in the Stockton community today. The most prominent styles include Queen Anne, Eastlake, Craftsman, Stick, Bungalow, Italianate, Pueblo, Spanish Colonial Revival and Classical Revival.Properties display such features as iron roof crests, stained and etched glass windows, exrtraordinary eave and gable detailing, gambrell roofs, chimney art, hitching posts and cut-stone paving blocks. The Magnolia Historic District was home to many of Stockton's and California's most notable owners of businesses and captains of industry. 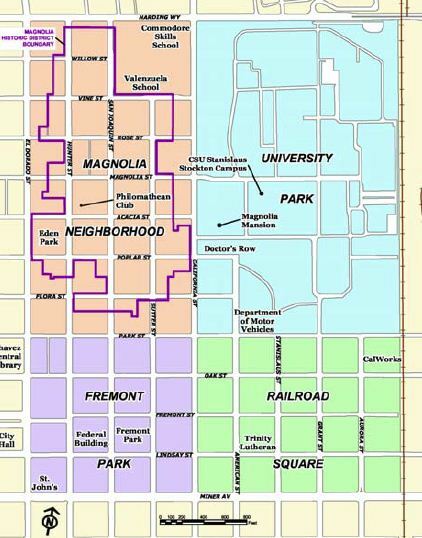 A property list of the Magnolia Historic Preservation District may be downloaded here.